The following are some of the interview questions NHK has conducted for WAT Med CEO, Raymond. Q1: What made you quit from a hospital pediatrician and what is WAT Medical doing in the field ofTENS (transcutaneous electrical nerve stimulation)? A: I appreciate my medical education and I love my patients. The thing is, when I was 30, my career in the future could be seen if I stayed in hospital as a pediatrician. Rather than accepting it, I chose to pursue a path that not only allow me to improve the lives of individual patients, but also the style of healthcare treatments that would ultimately benefit patients of future generations. My team are all motivated by this common goal. We are doing two things to make TENS therapy more helpful. 1. Specificity. We focus on specific conditions instead of trying to solve all the problems. One device is designed to offer solution for one kind of issue. Patients get what they exactly need, and have less opportunities to misuse the devices. 2. Wearable. By making the devices wearable, the therapies become available at any place and any time. It’s possible for consumers to enjoy evidence-based, safe and effective therapies with affordable prices. Q2: Does traditional eastern medicine, like acupuncture, influence your projects? A: We do take inspiration and knowledge from acupuncture while designing our devices. Acupuncture is considered the very early kind of neuro modulation which could be divided into 3 stages. 1. Acupuncture. Acupuncture has been around for thousands of years as a way to relieve pain and promote qualify of life for people. To be effective, however, the treatment needs to be performed by specially trained individuals. The effect of the therapy is different from day to day and person to person. 2. TENS. TENS technology industrializes and digitalizes this type of treatment. This transforms the skills of the trained individuals into physical products, allowing them to be much more accessible. The devices can put out measurable and repeatable treatments, free from potential fluctuations or inconsistencies between healthcare providers. 3. Targeted TENS. While traditional TENS are used to solve a wide range of issues, we took it to the next level and turned it into targeted-neuro modulation, which focuses on specific medical conditions. This is how our devices are designed. EmeTerm and HeadaTerm each put out electrical currents at a particular frequency that are meant to stimulate specific areas of the brain and nerve nuclei. NHK team also interview and film with Peter W.F. Ji, Co-Founder of WAT Medical, doctor degree candidate of UC Berkeley. 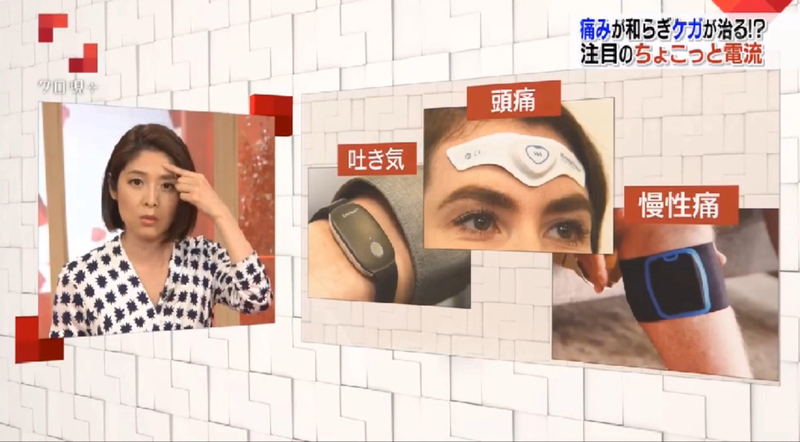 Peter introduces the mechanisms of EmeTerm anti-nausea and vomiting wristband and HeadaTerm anti-migraine head patch and demonstrates the devices. Peter also introduces WAT Med’s ongoing projects, including the solution for vision weakness and consumer level device, eEspresso, which could keep people awake and might be launched on 2020 CES in Las Vegas. 3. http://science.sciencemag.org/content/150/3699/971 Pain Mechanisms: a New Theory.